Présentation en anglais With an introduction by internationally renowned French pâtissier Pierre Hermé and the collective experience of eight master chocolatiers from the prestigious École du Grand Chocolat Valrhona, this comprehensive volume is a key reference for working with chocolate in the home kitchen. It includes: . 500 step-by-step photographs . 100 fundamental skills, techniques, and building-block recipes for cooking with chocolate (from tempering and ganaches to croissant dough, pastry creams to frozen desserts, and the secrets to achieving a perfect chocolate mousse) . A twenty-page guide to the science and history of chocolate and to essential chocolate-making ingredients . More than 100 recipes, graded for complexity: all the great classics (éclairs, profiteroles, chocolate soufflé) and contemporary desserts (macaroons, verrines), as well as tarts, baked goods, confectionery, and special occasion and iced desserts . Practical references: an illustrated guide to essential kitchen equipment; a glossary; and a comprehensive index of recipes and techniques . Eight bonus recipes by the greatest French pâtissiers, including Gilles Marchal of the Maison du Chocolat, Christophe Adam of Fauchon, and Jean-Paul Héven . A complementary ninety-minute DVD features live, concise demonstrations of fourteen essential techniques This comprehensive cooking academy in book form opens with 100 fundamental techniques and building-block recipes: chocolate basics (melting, tempering, coating, and molding); bonbon fillings (ganaches, pralines, pastes, and caramel); decorations (including presentation dishes and glazes); pastry, doughs, and sponges; creams (from crème anglaise and crème pâtissière to chocolate panna cotta); chocolate mousses; ice creams, sorbets, and sauces; and pâtissier's secrets (from marbling and the faultless cake to whisking egg whites and achieving the perfect chocolate mousse). Each method is explained in text and step-by-step photographs, with fourteen of them further clarified on the accompanying ninety-minute DVD. In addition to these techniques, more than 100 recipes, organized into eight sections, are simplified for the home cook: classics (Black Forest cake, Sachertorte, profiteroles, molten chocolate cake, chocolate soufflé); tarts (chocolate-pear, nut-caramel-coffee); desserts to share (choco-ginger churros, chocolate-vanilla marbled waffles, bittersweet chocolate panna cotta, chocolate cream verrines); teatime snacks (chocolate-pecan ladyfingers, brownies, chocolate croissants, macaroons); iced desserts (parfait, granita, sorbet, and ice cream); special occasion creations (bittersweet chocolate fondue, crisp triple chocolate cake, hazelnut praline Christmas log); candies (bonbons, coconut bars, truffles, lollipops); and new trends (Truffled Ivory Macaroons or filet mignon with bittersweet chocolate sauce). Each recipe is graded with a three-star rating, enabling the home chef to gauge its complexity and gradually expand his abilities through experience. Cross references to techniques, DVD footage, glossary terms, and complementary recipes make navigation easy. 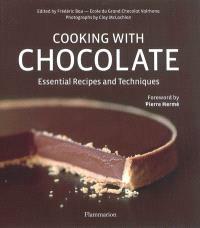 The volume includes practical resources: a visual dictionary of kitchen equipment; tips for conserving chocolate; a guide to the history and science of dark, milk, and white chocolate including the importance of cocoa content; and a detailed index to the recipes and techniques.